An extremely ancient breed, of majestic appearance, the Chow Chow was originally used in China as a hunter and guard dog and, on occasion, for herding cattle or even pulling sledges. His meat was considered a delicacy, resulting in the Chow being bred for his flesh and fur, thereby earning him the name of "The Cantonese Butchers' Dog." 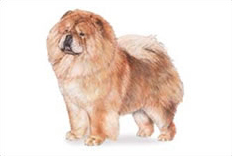 As if that wasn't bad enough, when the first Chow Chows went to England, they were kept in zoos. Rather lion-like in appearance, the Chow Chow is a massive, powerful and imposing animal with a dense two ply coat, complete with a big ruff around his neck. His unique features include his blue-black tongue and gums, distinctive scowling expression, and peculiar stilted gait. Independent, arrogant and curiously detached, the Chow Chow tends to be rather aloof and suspicious and not prone to giving his friendship lightly. However, when he does bestow his friendship upon you, you feel extremely privileged, knowing you have an ally for life. Protective in the extreme, the Chow Chow makes an excellent guard dog but is generally not fond of young children. He tends to be a one person or, in some instances, one family dog. He is very strong-willed with a stubborn streak and a definite mind of his own - therefore not the ideal subject for obedience training. Training and socialisation of this breed must begin at a very young age. Weight being from 25 to 40 kg.